Chiropractic care is a safe, drug-free approach to health care that focuses on the health of the brain and spinal cord, also known as the central nervous system. As the central nervous system is responsible for the systematic functions of the entire human body, it is essential to remove any interference that may be preventing optimal mobility and joint function. Regular chiropractic adjustments do just that. Bluffs Family Chiropractic is committed to evaluating your condition, locating the source of your discomfort, and restoring communication within your body, allowing for natural healing and happier, healthier living. Our practice offers several different methods of adjusting to better address your personal needs. While we most commonly use Diversified Technique, we also rely on the Thompson Technique and Activator Methods® for even lighter adjustments. Diversified Technique – One of the most common adjusting methods, this manual technique involves a high velocity, low-amplitude thrust to encourage correction. Thompson Technique – This technique relies on a full spinal assessment and drop table to correct subluxations. As the drop pieces take the brunt of the force, this adjustment is known for being extremely gentle. Activator Methods – Utilizing a tool called the Activator Adjusting Instrument to deliver a direct impulse of force to the spine, this method of care effectively restores motion to specific spinal vertebra or joints. There are many benefits of chiropractic care. It can increase function and mobility while simultaneously decreasing pain, improving sleep, and bettering overall well-being. We firmly believe in catering to the needs of the individual. If you are uncomfortable with one adjustment method, we will find another that meets your requirements. 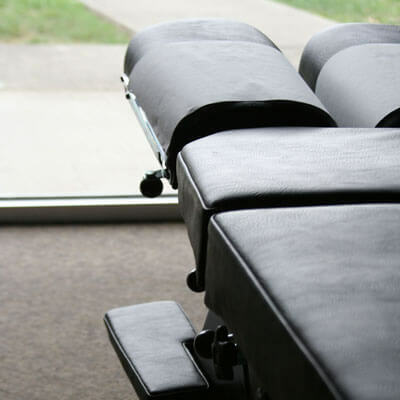 Rest assured, Bluffs Family Chiropractic will provide chiropractic care that is right for you! You name the condition—we are ready to help! Headaches, migraines, low back pain, neck pain, sciatica, and more have a place in our practice. With us, you are in the best hands. Your health and comfort are our top priority. Contact our practice to learn more about what we have to offer you.